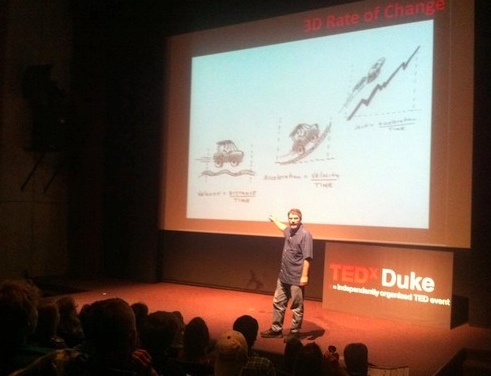 TEDx Duke Talk is Posted! Some of the images are a bit pixelated but you can get a copy of the slides in my previous post. Today I want to share a VISUAL STORY about THAT MOMENT TIME when you FIRST REALIZE what it REALLY MEANS TO BE A PARENT and HOW THAT TINY SLIVER OF AN INSTANT in the RELENTLESS UNFOLDING OF TIME forever CHANGES YOUR OUTLOOK on LIFE! Now, while I am sharing my PERSONAL FAMILY STORY …. we are all part of a big family called HUMANITY. So … in essence …. this story is really about what ALL OF US CAN DO to PREPARE EVERY CHILD to SUCCEED in a WORLD THAT WE CAN BARELY IMAGINE. Now, I have been TEACHING for over 15 YEARS. WHY? Because, for me, there is NOTHING MORE FULFILLING than experiencing THAT MAGICAL MOMENT when another HUMAN BEING is VISCERALLY IMPACTED by the POWER OF AN IDEA. This is my Grandad, Michael O’Driscoll … He was the HEAD MASTER at the LOCAL TECH-SCHOOL in my home-town of Youghal, Ireland. Everyone knew and loved my Grandad. He was a REAL PILLAR OF THE COMMUNITY. NOW, every CLOUD has a SILVER LINING …. In this case, I TAKE SOLACE in the fact that Grandad PASSED AWAY PAINLESSLY doing something that he LOVED surrounded by his PEOPLE WHO LOVED HIM. Grandad has this WONDERFUL WORKSHOP at the back of his house. As a GOSOON, I spent COUNTLESS HOURS with him TINKERING WITH BROKEN RADIOS or REPAIRING GRANDFATHER CLOCKS. Through those INTERACTIONS, his passion for FIGURING THINGS OUT was passed along to me in the form of my KEEN INTEREST TECHNOLOGY. To this day, I still remember THE MOMENT when this KEEN INTERST became an UNYIELDING OBSESSION. It was April of 2000 ….. Another BEAUTIFUL SPRING DAY ….. I was on a plane coming in to land at LaGuardia. On the final approach, I looked out the window at ONE OF THE GREATEST MARVELS of HUMAN and TECHNOLOGICAL ACHIEVEMENT EVER: NEW YORK CITY. I DISTINCTLY REMEMBER that the Empire State Building LOOKED ALMOST ALIVE as it SHIMMERED in the EARLY MORNING SUN. And yet, despite this INCREDIBLE vista, I FOUND MYSELF CRYING UNCONTROLLABLY … I was COMPLETELY DISTRAUGHT. WHY? Because I had READ Bill Joy’s article “”WHY THE FUTURE DOESN’T NEED US” in Wired Magazine and, I IMMEDIATELY realized that I had FALLEN PREY TO THE SIREN SONG of TECHNO-OPTIMISM….. and I’d never PAUSED TO PONDER THE NEGATIVE CONSEQUENCES of technology’s RELENTLESS MARCH through the UNFOLDING OF TIME. And thus began my DEEP DIVE to understand how TECHNOLOGY IMPACTS HUMANITY. To START WITH, I paused to ponder the TECHNOLOGY ODYSSEY that my Granddad went through DURING THE ARC OF HIS LIFETIME. He witnessed the invention of the Telephone, the Television, the Automobile, Manned Flight, Sputnik, Transatlantic Radio, Highway Systems, A MAN landing on the moon, …. He even saw the advent of the Information Revolution with Computers. If you stop think about the AMOUNT OF CHANGE MY GRANDFATHER ABSORBED DURING HIS LIFETIME, I am ACTUALLY surprised he did not SPONTANEOUSLY COMBUST walking down main-street in Youghal as opposed to passing away ON THE GOLF COURSE. Now, these are my kids….Aidan’s 8 and Liam is 5….and BOTH the RESEARHER and the FATHER in me want to know ONE THING…..
How will the ARC OF MY KID’S LIVES COMPARE to that OF MY GRANDFATHER’S? What will their TECHNOLOGY ODYSSEY look like? Will they experience MORE OR LESS CHANGE? Will they be as FULFILLED IN LIFE as he was? And perhaps the MOST IMPORTANT QUESTION of all….WHAT CAN I DO AS A FATHER TO ENSURE THAT AIDAN AND LIAM EXPERIENCE THE FULLNESS AND JOY of life THAT MY GRANDFATHER DID? Here, I’m suggesting that the TIME-SIGNATURE OF LIFE IN THE 21ST CENTURY is NO LONGER SYNCHRONIZED WITH VELOCITY OR ACCELERATION. INSTEAD, it is SYNCOPATED WITH JERK…. And as a result, TECHNOLOGY is LITERALLY jerking HUMANITY AROUND. Now, BECAUSE we HUMANS ARE NOT PROPERLY INSTRUMENTED to process a THIRD-DERIVATIVE rate of change we have NOT noticed that our planet has developed a DIGITAL NERVOUS SYSTEM that CONNECTS PEOPLE AND AMPLIFIES INSIGHTS at a SPEED AND SCALE that we can BARELY IMAGINE. Basically, the WORLD HAS WEAVED THE WEB into an ELECTRONIC EXOSKELETON that is MOVING THROUGH TIME AT a RATE OF CHANGE we HUMANS are not well equipped to DETECT. AND SO, as TECHNOLOGY STARTS to SERIOUSLY JERK US AROUND, we find ourselves facing a DIGITAL DIVIDE OF A DIFFERENT KIND. This divide is NOT about the HAVES and HAVE NOTs in terms of ACCESS. It is a divide about the KNOW and KNOW NOTs in terms of SURVIVAL. Given that each individual’s ABILITY TO PROCESS AND STORE INFORMATION has REMAINED RELATIVELY CONSTANT OVER TIME, how do we BEGIN to BRIDGE this EVER-WIDENING DIGITAL DIVIDE? In the ENSLAVED scenario TECHNOLOGY LIMITS, BOUNDS AND ATTENUATES THE FULFILLMENT OF HUMAN POTENTIAL. Technology plays a role in how we CONSTRUCT OUR SENSE OF IDENTITY. WE REDUCE OURSELVES, and MAYBE OUR DREAMS, to fit the CURRENT FORM FACTOR OF THE TECHNOLOGY. Here, Aidan and Liam SURF IN THE SHALLOWS OF THE INTERNET ERODING their CONTEMPLATIVE AND INTROSPECTIVE THINKING ABILITIES …. Opting instead to go to the ALWAYS ON ANSWER BOX when faced with a QUESTION. At the highest level, our INTERNET INDWELLING DUMBS US DOWN to a point where we a become IT LABORERS living a life of INDENTURED SERVITUDE to SERVER FARM OWNERS. Curiosity is the underlying MOTIVATION for learning. It is the LUBRICANT for the LEARNING PROCESS and the LIFEBLOOD of PERSONAL GROWTH. Without CURIOSITY our children will STOP LEARNING. Without learning they will STOP ADAPTING…WITHOUT ADAPTATION there is little chance for SURVIVAL in a WORLD that’s CHANGING as fast as ours. Without knowing WHO YOU ARE OR WHAT YOU STAND FOR, you are far more likely to END UP somewhere OTHER THAN where you WANT TO BE. Without a STRONG SENSE OF IDENTITY it MUCH MORE likely that our children will become ENSLAVED by technology or ENMESHED with it. In a world awash with information a HEALTHY SENSE OF SKEPTICISM becomes PARAMOUNT. RESPECT FOR OTHERS, even if they OPPOSE your own POINT OF VIEW, is CORE TO THE FABRIC of a JUST AND FAIR SOCIETY. Without ENSURING that the STRENGTH OF ANY CONCLUSION is equally matched by the STRENGTH OF ITS EVIDENCE, our children could quickly become CAUGHT UP in a world that LACKS VERACITY. As the world OUT THERE Jerks us around UNPREDICTBLY, it important that the world IN HERE maintains ITS SANITY. Without ONGOING SELF-REFLECTION the likelihood of our children LOOSING THE BEARINGS OF THEIR INTERNAL COMPASS and getting LOST in a SEA OF DIGITAL DILUSSION increases. Play is not the opposite of work. It is a CRUICBLE FOR CREATIVITY and a PORTAL TO NEW POSSIBILITY. PLAY also allows us to understand how to WORK WITH OTHERS and WORK THE NETWORK to accomplish a DESIRED OUTCOME. Play fuels the QUESTING DISPOSITION that every child should have in their toolbox today. WITHOUT PLAY the joy and wonder of life are rendered IMPOTENT. Who would want their child to live in such a DULL AND DRAB world anyway? HOWEVER, I DO HOPE that my story MOTIVATES you to WORK HARDER at doing WHAT YOU ALREADY KNOW you SHOULD BE DOING as a PARENT. And for ALL OF US here TODAY, lets PROMISE OURSELVES to HIT AT LEAST ONE OF THESE TOUCHSTONES to help a CHILD WE KNOW succeed in a WORLD WE CAN BARELY IMAGINE, LET ALONE PREDICT. GO RAIBH MILE MATH AGAT! Just back from a jam-packed day at TEDx Duke. The speakers were fantastic, insightful and inspiring. Here is a picture someone took of me as I riffed about the Third Derivative Rate of Change (Jerk) and how technology is literally Jerking Humanity around. Many of the folks who came up to me after my talk mentioned how cool the graphics were. This talk was a CO-CREATIVE ENDEAVOR between myself and my friend Gary Zamchick who is a phenomenal visual talent. As promised, here are the charts I used so you can see what I mean! All in all a GREAT day……I hope Duke does it again next year! 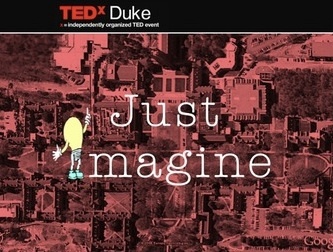 You can access the TEDx Duke page here. I have worked very hard to boil own all I have learned about the impact that technology is having on humanity into a 12 minute story that I hope people will find compelling. This was an incredibly fun and liberating activity as I had the opportunity to partner with one of the most creative and intelligent people I know, Gary Zamchick, on this project. Gary is an incredible visualizer and we spent a few long sessions talking through the narrative and getting the right set of graphics to go along. If you want to see the talk live, I go on at about 1:25 PM tomorrow, Saturday, April 2….you can catch the UStream here. I hope you can drop in virtually to see what Gary and I have cooked up. I will post my charts and a link to the talk once done. The way we know they ought to be. And incredible hope for what comes next. Jane’s argument for how Gamers and Game culture can improve the real world in in total synch with much of what I was discussing with regards to the application of emerging technologies to help deal with the Gulf Oil Spill on Opensource.com today. The two EPIC games we need to get everyone involved in right now are what I call SOS games- Stop the Oil Spill and Save our Shores. Spend the 18 minutes watching Jane….after you see World Without Oil, Superstruct and Evoke, you too will see that Games could well be the foundation upon which our sustainable future depends. I don’t think there is a single human being on this planet who does not want to see the leak in the Gulf stopped….so why don’t we invoke Clay Shirky’s “Here Comes Everybody” mantra and get the world involved in solving it’s most urgent and important challenge? The problem that we face TODAY cannot be solved with the same level of thinking that created it. Lets try to push this meme. My own fear is that, unlike the Financial Crisis, BP itself is too “small to solve” this problem we need a world-scale ideation and prioritization scheme to address this issue and we need it NOW! We need those who are currently working on this issue to be prompted to think differently and those with adjacent skills to help frame the problem differently to see if there are transferrable concepts that can help stop this leak. Imagine if all the petroleum engineers on the planet, irrespective of where they work, each dedicated two hours of serious brainstorming to this effort. What if we then mashed this up with disciplines of industrial design, architecture, fluid dynamics, and physics to land upon a plausible and immediate portfolio of potential solutions? This is NOT a technology problem. IBM could provide their Jam technology to drive a 72 hour brainstorm and winnowing process to determine the top ten solutions (Facilitated Ideation plus Predictive Market Prioritization). Once ideas are at the solution stage virtual team rooms can be provided to cross functional teams in a 2 Day Solution Planning Challenge to come up with project plan/budget for their proposed solution according to a standard “Top Sheet” template. A board of experts would then review these plans and select the most likely solutions and the order in which they would be attempted. More importantly, all of this could be accomplished within the NEXT FIVE DAYS if we could aggregate resources and capabilities in a Web 2.0 way across industries and academia. It is time to take a page out of Nike’s book …. we need to JUST DO IT! What may be possible in practice may take too long to vet in theory. We need the world’s biggest brainstorm here and we need it NOW! To borrow a line from IBM current marketing campaign with a little twist, we need to leverage the smarts of the whole planet to stop the spill and we need to do it now it NOW! Taking this approach certainly cannot hurt and most likely would help address something that will impact each and every one of us. In the time it took you to read this, how many more thousands of gallons have spewed into the Gulf? If you believe this idea has merit, please propagate via your SoMe channels. Tonight Karl and I will be chatting with Randy Hinrich’s class at University of Washington. I prepared a summary overview of the book in PPT to get the conversation going. Knowing Ran’s students, we will no doubt be getting into the nitty gritty on a lot of these charts but I thought I would share for others who have yet had the opportunity to browse the book. 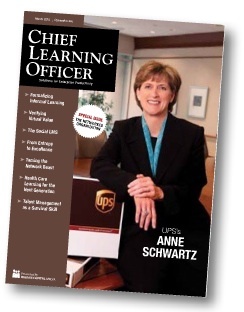 The good folks at CLO magazine were kind enough to ask me to put together an “In Conclusion” piece for this month’s magazine in advance of their “The Networked Organization: Leading Learning in a New Economy” conference next month. You can view all the articles in this issue for free by clicking here. On April 22, 1993, Mosaic Web browser, the system widely believed to have popularized the Internet, was introduced to the world. Sixteen years later, we’re still surfing this ever-expanding digital domain — and so frequently and naturally that it’s practically ingrained into the very fabric of our lives. In fact, much like the oxygen we breathe every day, we tend only to notice the profound impact of the Internet on our daily existence when it disappears. Want proof? The next time Internet connectivity is down at your office, look around at your co-workers. Most likely, you will see groups of people aimlessly wandering the halls, as if they’ve forgotten their roles in the organization and how they add value. If you detach people from this virtual network, productivity heads south quickly. The Web has permeated what we do to such an extent that we have become oblivious to the profound impact it has had on how we connect, communicate, coordinate, collaborate and take collective action. Information no longer moves in one direction — i.e., from the top of the enterprise to the bottom, or from teacher to student. Instead, information travels from place to place based on individuals’ desire to make more effective decisions or develop keener insights about a particular situation, or because they are motivated to learn about a certain topic or how to complete a given task. Like it or not, the invisibly pervasive Web has ushered in the era of the autonomous learner: an era where information accessed within the work context often trumps instruction that is consumed separately from it. An era where a teachable moment that surfaces in the work context is more likely to be immediately addressed via a Google search, Facebook message or Twitter post than an LMS lookup for a course. In the era of the autonomous learner, content may still be king, but context has clearly become the kingdom. Given this framing, we can begin to understand the Web’s own evolution as an expanding ecosystem that facilitates collective action, learning and growth. During the past 16 years, it has essentially become a ubiquitous and instantaneous collaborative learning platform where subject-matter networks anywhere on the planet can be tapped into for their insight, expertise or opinion. As the Web continues to expand into the third dimension, with the likes of avatar-mediated virtual environments, the confluence of interactivity and immersion will allow these subject-matter networks to operate in a more intuitive and engaging way. In business today, insights drive innovation, and innovation drives profitable growth. Within the digital network, information is the currency, individuals are the transport mechanism, interaction is the transfer mechanism, and insight is the value-added outcome. These insights are generated from serendipitous knowledge accidents — that magic moment wherein expertise collides with opportunity and entirely new industries are born. The ability to leverage the Web and the emerging immersive virtual environment to instantly coalesce capability around an increasingly unpredictable set of market opportunities is the pre-eminent challenge facing the 21st-century enterprise. Just as businesses have had to change their strategies and infrastructures to remain competitive in increasingly dynamic markets, learning functions also must adapt to meet the dynamic needs of the enterprises they serve. Consequently, the primary challenge for the 21st-century learning function is to redefine its value proposition from rapidly filling employees’ heads with knowledge via classroom-based learning to applying internal expertise to the problem or opportunity at hand in real time via the network. Not embarking on this transformation could well result in the learning function becoming captive to its own limiting paradigms and marginalizing its value to the enterprise to the point of its own extinction. Last Saturday, Karl and I had the privilege of keynoting the VWBPE conference. Over 5000 avatars attended the conference in Second Life and treet.tv has done a wonderful job of editing the presentations. I highly recommend checking these talks out. Karl has a very interesting blog called “I Have Seen the Future of Conferences….and it is 3D!” that talks about his experience at VWBPE last week. Click HERE to check out the other cool talks from the VWBPE conference. My good friends at Red Hat have launched a great site called opensource.com. It’s purpose is to be a catalyst for a community that is exploring how open source principles and practices can be leveraged in business, education, government, law and life. It is a really cool site. 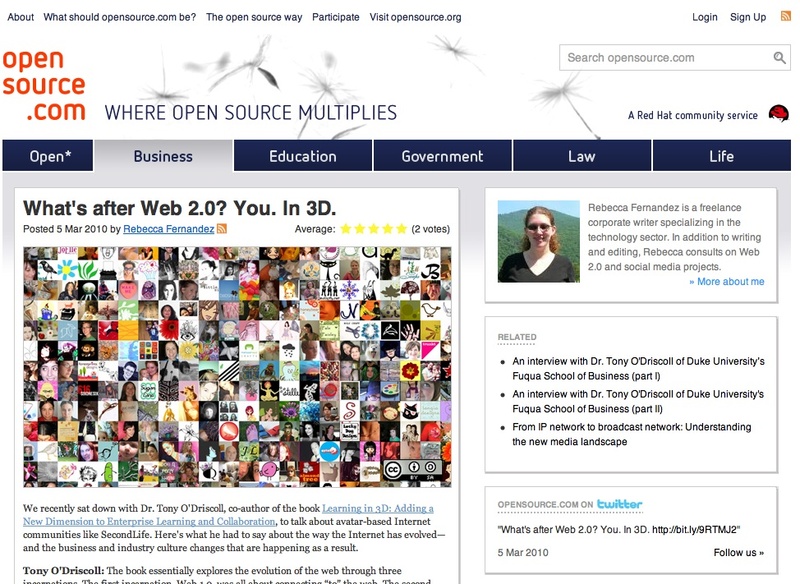 If you are into open source, wisdom of crowds, crowd sourcing, social production or the like you should check it out. Rebecca Fernandez interviewed me about Learning in 3D for the site. You can check out the interview here.